On the morning of 20 February, while still some 453 nautical miles northeast of Rabaul, Task Force 11 was spotted by a Japanese Kawanishi H6K “Mavis” flying boat. The enemy spotter plane was detected by Lexington’s radar some 35 miles from the carrier. A six-plane combat air patrol was launched. Two fighter planes under the command of Lt. Comdr. John Smith “Jimmy” Thach, the Commanding Officer of VF-3, shot down a “Mavis” about 43 miles out, but not before it had radioed Lexington’s position. Admiral Brown’s plan depended on the element of surprise. With that gone, the attack on Rabaul was canceled. However, Brown decided to proceed towards Rabaul to engage the Japanese aircraft into action. Two other “Wildcats” of the combat air patrol shot down another “Mavis” 35 miles ahead. The Lexington spotted nine Japanese Mitsubishi G4M1 “Betty” bombers on its radar that afternoon. Lt. Comdr. Thach led a formation of six “Wildcats” into the air to intercept what turned out to be Betty’s carrying 550-pound bombs heading toward the Lexington. 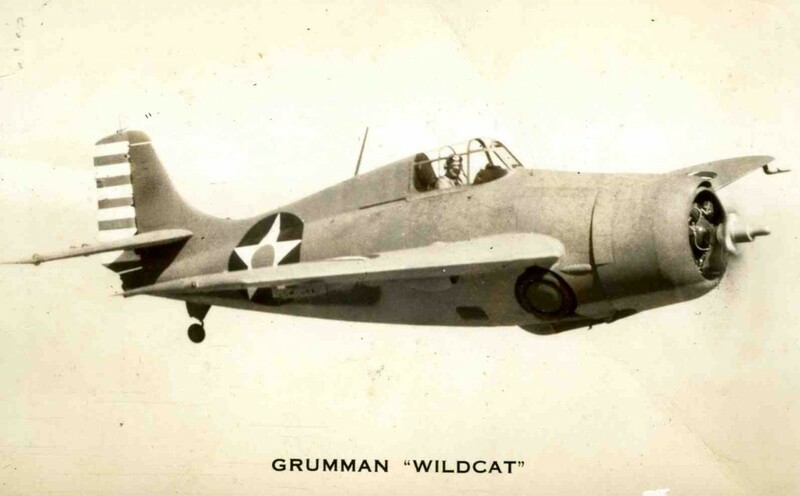 During the attack, each of the “Wildcats” destroyed an enemy bomber and two others were damaged. The carrier’s anti-aircraft guns finished the rest. A half-hour later, the Lexington’s radar picked up a second formation of eight Bettys only 12 miles out. Six more Wildcats of VF-3 were launched from the carrier’s deck among them Lt. “Butch” O’Hare’s plane. The formation split into three sections to search for the enemy. Lt. O’Hare and his wingman Lt. (jg) Marion W. “Duff” Dufilho raced eastward and were the first to locate the Bettys. The two arrived 1,500 feet above eight attacking “Bettys” nine miles. Having the altitude advantage, they both rolled into the attack. Unfortunately, Lt. (j.g.) Dufilho discovered that his guns were jammed and was forced to turn away. Lt. O’Hare didn’t hesitate, and attacked the “V” shaped enemy formation of eight Bettys alone. The other four Wildcats of VF-3 were too far away to assist him. Lt. O’Hare made three fast and furious attacks on the enemy bombers. First, he performed a high-side diving attack in which he was able to penetrate the right engine of one of the Bettys. Then he was able to maneuver around and attack another enemy bomber. As he made his third and fourth diving passes, the Bettys flew into the defensive fire of Task Force 11’s combined anti-aircraft guns. Five Japanese Bettys managed to drop their ten 550 lb bombs, but they all missed the wildly maneuvering carrier. 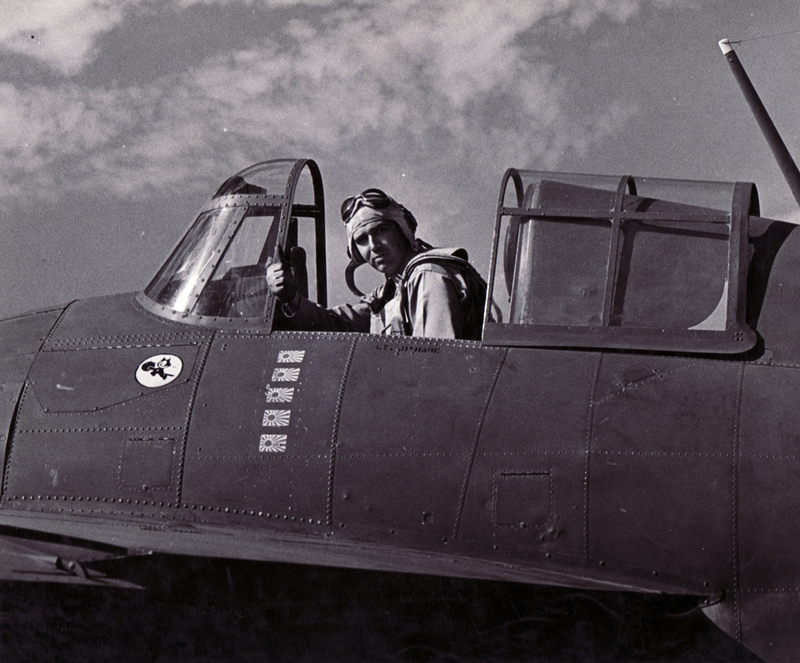 Lt. Edward H. “Butch” O’Hare in his Grumman F4F-3 Wildcat giving a thumbs up at Naval Air Station Kaneohe, Oahu, Hawaii. 10 April 1942. Note “Felix the Cat” insignia of Fighting Squadron Three (VF-3) and five Japanese flags representing the five enemy bombers he was credited with shooting down. Courtesy of The National Archives. By now Lt. O’Hare was out of ammunition. Luckily for him, Lt. Cmdr. Thach and other Wildcat pilots joined the fight. Lt. O’Hare believed that he had shot down five of the Bettys, and severely damaged a sixth one. Lt. Cmdr. Thach later reported that at one point he saw three of the enemy bombers falling in flames at the same time. He also figured that Lt. O’Hare had used only sixty rounds of ammunition for each Japanese plane he destroyed. Admiral Brown and Capt. Frederick C. Sherman, the Lexington’s commander, were both of the opinion that Lt. O’Hare’s actions saved the carrier from severe damage or possible loss. In the after-action report, Captain Sherman recommended that Lt. O’Hare be decorated. Lt. Edward Henry “Butch” O’Hare was credited with five confirmed victories, which made him the first U.S. Navy flying ace of World War II. He was promoted to the rank of Lieutenant Commander and became the first naval aviator to be awarded the Medal of Honor in World War II. Medal of Honor presentation: President Franklin D. Roosevelt congratulates Lt. Edward H. “Butch” O’Hare upon receipt of the Medal of Honor, the highest military decoration awarded by the United States government. On 21 April 1942, Lt. O’Hare and his wife Rita were ushered into President Roosevelt’s office at the White House. 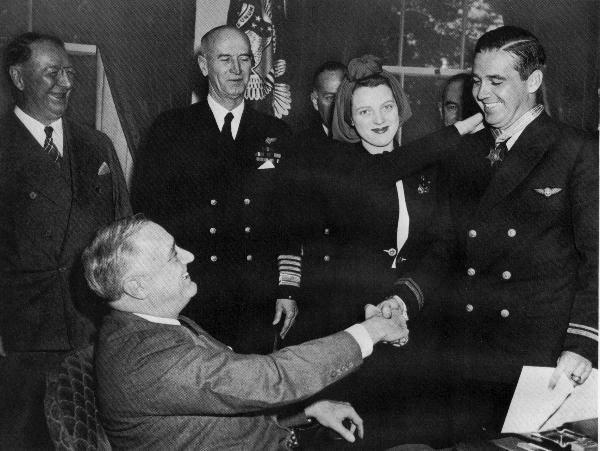 The President promoted O’Hare to the rank of Lieutenant Commander and awarded him the Medal of Honor in the presence of his wife Rita, Frank Knox – the Secretary of the Navy, Admiral Ernest King, and others. While President Roosevelt was looking on, O’Hare’s wife Rita placed the Medal around her husband’s neck. While leading the first nighttime fighter raid off of the USS Enterprise (CV-6) on 26 November 1943, O’Hare was presumably killed in action, although his Grumman F6F-3 Hellcat was never found. The USS O’Hare and O’Hare International Airport in Chicago are namesakes of Lt. Butch O’Hare. This was a great article and as always a learning read. Look forward to many more!